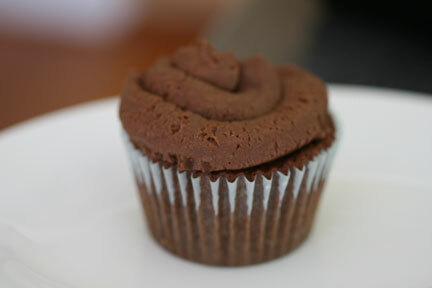 I was stumbling the other day and happened across this recipe for Chocolate Nutella Cupcakes on 52 Kitchen Adventures. My jaw dropped and right then, I decided that I would make them. The idea had been percolating in my head for a couple of weeks that I was going to try to make cupcakes from scratch – ever since I went to the cupcakery up the street and paid almost $3.00 for a cupcake. I’ve watched my fair share of Cupcake Wars and Cupcake Girls. I just had the cupcake itch and that recipe was all I needed to get me to try it. I already had most of the ingredients already, but I needed to head to the store to pick up the magic ingredient – Nutella. (P.S…even though this isn’t the end. If you haven’t tried Nutella you are missing out. It is AWESOME.) When I got home, I began the baking process with 2 hours of waiting. Why? Because the recipe says you need room temperature butter and room temperature eggs. I’m not sure why, but I was going to follow the recipe to ensure my cupcakes were delicious. After a couple of hours, I was ready to begin the baking process. 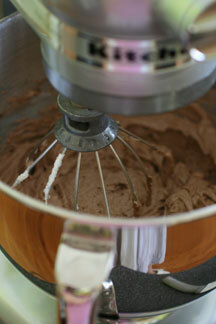 I followed the recipe and used my trusty KitchenAid mixer to do all the heavy lifting mixing. I carefully scooped everything into the cupcake pan, placed them into the oven and closed the door in what I can only describe as a mixture of euphoria (hey – I’d been inhaling chocolate fumes) and triumph. I took a quick look at the recipe when it hit me – I had used twice as much butter than I was supposed to. As the cupcakes baked, I tackled the frosting. This time I was careful to ensure that I only used ONE stick of butter. This did not, however, prevent me from “sampling” the Nutella as I scooped it into the mixer. More than a little accidentally got onto the edge of the bowl and I mean…you can’t let good food go to waste, you know what I mean? Finally, the full cup of Nutella got into the bowl; I flipped the switch and voila! Nutella frosting. A few minutes later, the oven timer went off. I pulled them out, let them cool in the pan for 10 minutes, then set them on wire racks to fully cool down. Then it was time to frost the cupcakes. The only problem was that I didn’t have a piping bag or piping tips. Ack! Being the Macguyver that I am, I sliced off the end of a gallon Ziploc bag, threw the frosting in (folding the bag of my hand while filling like I see the pros do on TV) and began “piping” – or should I say “Ziploc bagging” the frosting onto the cupcakes. I honestly think they came out looking pretty tootin’ good…especially considering that the frosting came out of a Ziploc bag! I’ve gotten permission to share the recipe below, but I also strongly encourage you to check out the 52 Kitchen Adventures post to learn about her inspiration for the recipe. 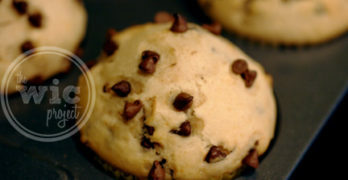 This recipe is reprinted with permission from 52 Kitchen Adventures and was adapted from Cupcake Project and Chockylit. Looks great! Thanks for the idea. You are a cruel lady!! LOL this look sooooooooo good!! OMG I will have to try them. Oh, these look so good! My husband LOVES nutella..I made Nutella brownies once and they were amazing! Nutella brownies….I think that’ll have to be next on my “to-bake” list. Did you follow a special recipe? They really didn’t LOOK done when the timer went off but I think I left them in longer and overdid them a bit. Might have to play with timing! Very tasty though! Apparently there are a lot of uses for Nutella. I can’t wait to try these. I love Nutella and chocolate. These cupcakes will be my downfall, but I can use the recipe for a birthday.